The original source for the following koan was translated into English from a book called the Shaseki-shu (Collection of Stone and Sand), written late in the thirteenth century by the Japanese Zen teacher Muju (the "non-dweller"), and from anecdotes of Zen monks taken from various books published in Japan around the turn of the 20th century. The more she longed for Enlightenment the further off it seemed. But one moonlit night she was carrying an old bucket filled with water from the well that eventually came to bear her name, and as she walked she noticed the full moon reflected in the pail of water. As she continued along the path the bamboo strip that held the pail staves broke. 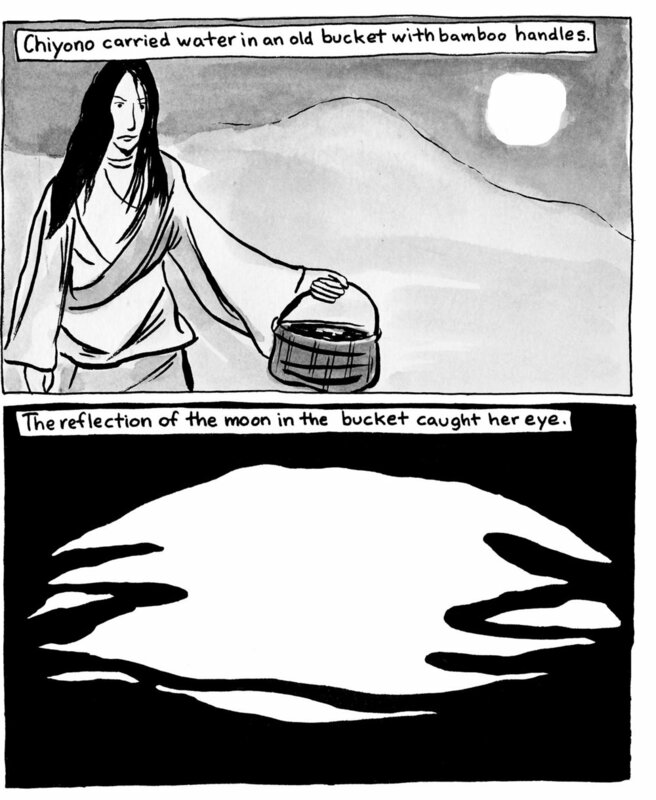 The pail began to come apart, the bottom broke through, and the water disappeared into the soil beneath her feet, the moon's reflection disappearing along with it. In that moment Chiyono realized that the moon she had been looking at was just a reflection of the real thing...just as her whole life had been...she turned to look at the moon in all it's silent glory, and ...that was it. 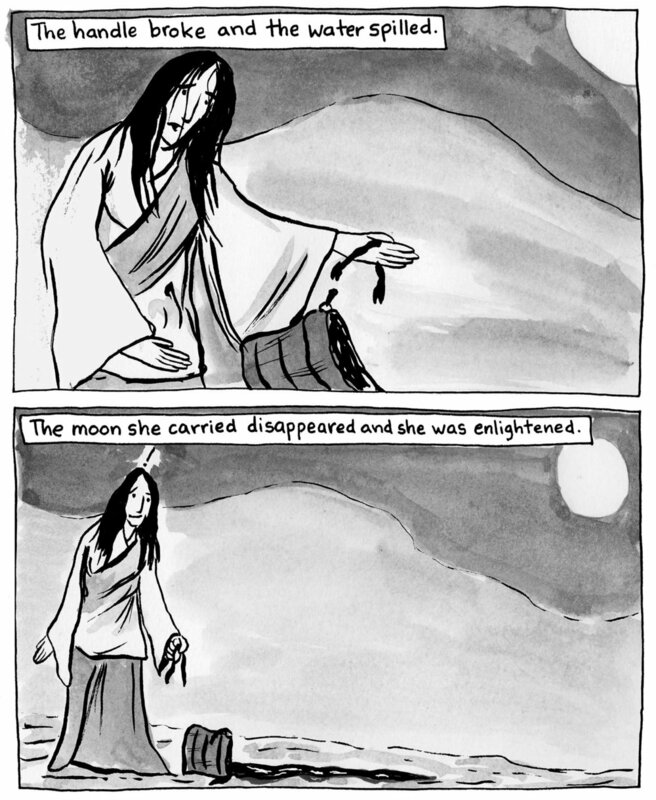 Like the moonlight driven event surrounding the Enlightenment of the mysterious wandering monk Totapuri, or similar moonlight driven event foretold by the Wanderling's Zen Mentor and described in Dark Luminosity, Chiyono herself disappeared. She was NOT ----- and what IS, was. and emptiness in my hand!" One day during a period of time in my life that I was doing hard time in a Zen monastery, a monastery that was perched precariously high up on the side of a steep Chinese mountain situated somewhere along the southern edge of the Qinghai-Tibet plateau in the rarified air of the Himalayas, a very old and ancient man came down from the mountains and apparently asked to see the white monk who was said to be under the protection of the Lord Buddha. I was quickly brought before his presence. 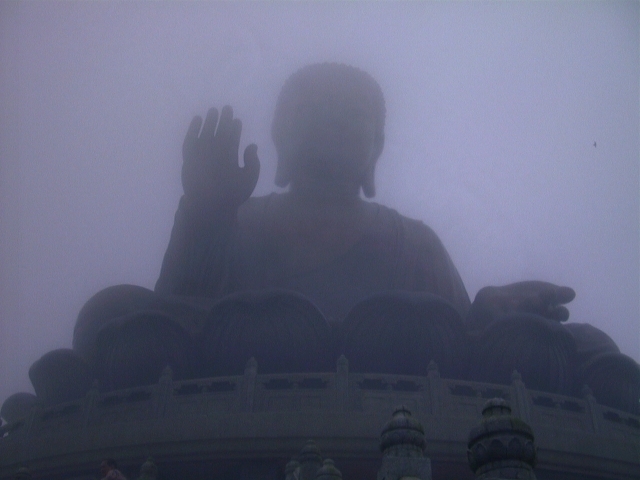 Because of respect paid him by all, plus the serenity he seemed to abide in, it was clear the man was Enlightened. Even so, no sooner had I arrived in the meditation hall and he took one look at me, tall, gaunt, and a westerner, even in the highly subdued light of the stonewalled hall I detected an ever so slight change of expression brush across his face. No sooner had I bowed he turned to walk away, then in a flash he swung back around with his staff swinging hard toward me. As I raised my arm to block the blow just as quickly he lowered the motion of the swing and before I was able to counter the move he had knocked me off my feet. Huge roars of laughter permeated the room. Here was this billion year old man who had easily knocked me to the ground. He extended the end of his staff to pull me up, which I took. He then strode out of the monastery and back into the mountains. There was something about the old man that would not just let go and it continued to nag at me for the longest time. Months went by. Finally, when the weather turned such that I could, I sought the old man out, visiting him at what was not much more than a stone-pile hut along the edge of a stream. Going to and from his hut was a very arduous several day trek, much of it through rugged and steep very high altitude territory. A good portion of the trail followed along side a series of streams that may or may not have been the same one, that was sometimes rushing and other times placid depending on the steepness or flatness of the terrain. 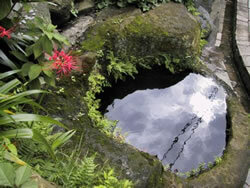 On the second day out returning from the Zen man's abode I suddenly came upon a person with their back to me kneeling with a wooden stave bucket scooping water from the stream. There was some distance, maybe 30 feet or more, between the path where it was elevated several feet above the stream and the stream itself. Except for the Zen man, in all the time since I had left the monastery proper I had not seen a living soul, at least anyway, since I had entered the steep mountains. 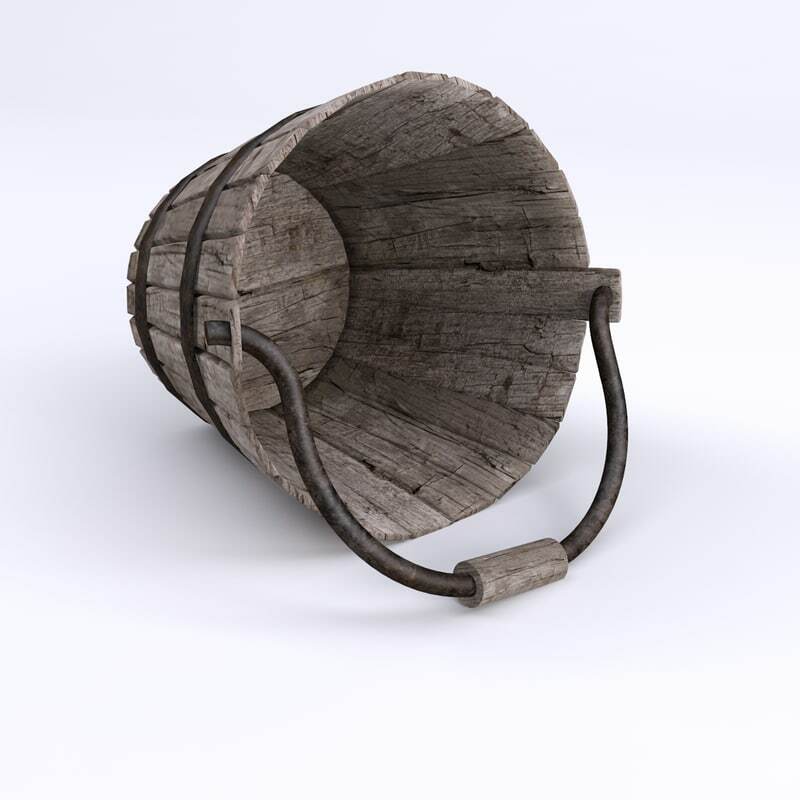 Coming across someone set me aback, especially someone with a wooden bucket. The last thing a person merely traversing through the area would need to be carrying with them would be a heavy full size wooden bucket, meaning to me possibly someone more permanent in some fashion. 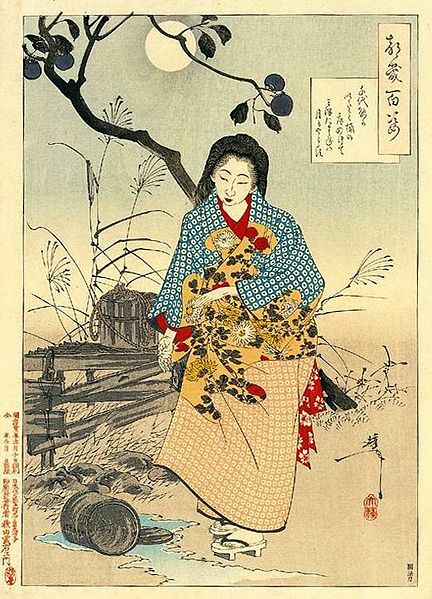 When I walked down toward the stream and about half way between the path and the stream announced my presence, the person, startled, let slip the bucket into the downstream flow. At that moment, turning toward me I could see the person was a woman. From my position off the trail and closeness to the stream I was able to quickly stop and retrieve the bucket, but after doing so and turning back, the woman was gone. The next morning just as I was waking and trying to shake off the morning chill as well as get the kinks out after a night of sleeping on rocks and hard ground, I looked down toward the trail and saw the woman standing there looking at me. This time rather than disappearing she gestured for me to join her. She had made a small fire and was in the process of making hot tea, a truly welcome delight. She apologized for her behavior the day before saying she was so shocked to see anyone, especially so a person of Caucasian descent that she sort of lost it. She told me she was an American and had been travelling alone and on her own in Europe and Asia since she was 21, or as she put it, roughly five years or a little more. She said that her name was Hope Savage. In the thirteenth century an extraordinarily realistic portrait statue (chinso chokoku) was carved depicting Abbess Mugai Nyodai in her seventies. Chinso statues are a category of remarkably realistic life-sized statues of the seated figures of historical Zen masters made as substitutes for the living person to convey the essence of the Zen master to his disciples after his death. This statue, the only thirteenth-century portrait statue of a female Zen master extant.